Yo, ho, ho, and a bottle of rum! Ahoy there me lads and lasses! Hope ye all are having a great day like me and the crew. Aye, this old salt is in a good mood because we had a successful booty hunting adventure that let us score a lot of gold coins, pearls, and all other kinds of treasures. The Jolly Roger has not turned into a party place! But ‘afore I join those buccaneers in the party and ‘afore I get drunk drinking rum, let me share ye another review. This time, we’ll talk about this app called Cross-Stitch World by Inertia Software. The cross stitch patterns on this app look like the real thing. It feels like you are really working on a cross stitch project without the risk of being pricked or pierced by a needle. Those who are into cross stitching but don’t have access to the real tools needed to do this or those who would like to experience the feel of doing one will find this app interesting and helpful. Even the way the stitches look are realistic even if you zoom them in. They look like real threads stitched on the cloth. There are thousands of patterns to use, but only a few are available by default. The other patterns can be purchased using the game currency. You earn currency through the patterns that you complete. However, the patterns for purchase cost a lot so if you will easily run out of money. In-app purchase is available, which uses real cash to get more patterns and continue playing, although the app is free to download. It’s easy to learn how to use this app. Choose the pattern from the default patterns available and work on completing it by tapping on the thread color and tapping on the letters that correspond to it. This will add a stitch on that letter, until you complete the pattern. It also comes with an option to create your own pattern using your own image, although there are times that it doesn’t work. 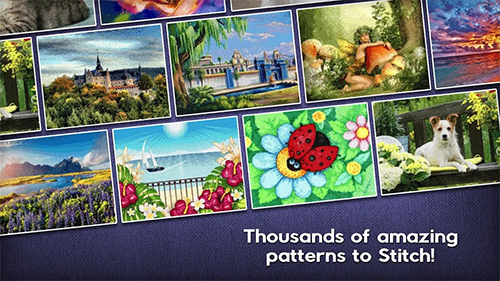 Cross-Stitch World is free to download and play. It’s easy to learn how to use it since it only requires tapping on the threads and their corresponding letters. The patterns also look like the real thing so it feels like doing a real cross stitch project. It also lets you use your own image to be used as a custom pattern. While this app comes with thousands of patterns, only a few are available by default. Others must be purchased using the game currency and if you run out of it, you may need to make an in-app purchase in order to continue playing. 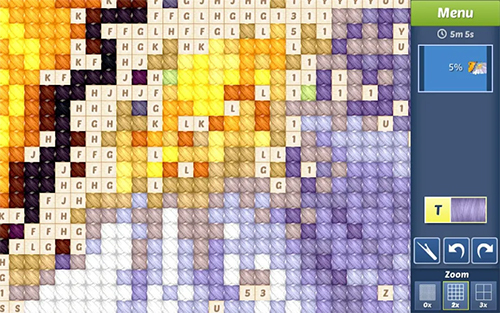 Cross Stitch World is a free to download app that comes with thousands of patterns. It’s easy to learn and it looks like real thing. Other patterns are available for purchase using the game currency, but overall, it’s a fun and relaxing way to pass time.